While it is true that no two car accidents are alike, there is one type of accident that is more common than others. There are millions of car accidents in the U.S. each year. They happen for a very large variety of reasons. While it is true that no two car accidents are alike, there is one type of accident that is more common than others. 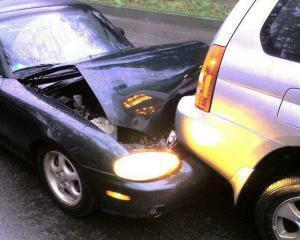 Rear-end collisions are the most common type of car accidents today. The National Highway Traffic Safety Administration (NHTSA) claims that a rear-end collision happens every 8 seconds in the U.S. They generally do not cause fatalities, however, they often cause serious and costly injuries. There may not be much damage done to either of the vehicles involved. Insurance companies often use this to prove that no one was badly injured. Also, because rear-end car accident injuries may take a while to manifest, the insurance company may pressure you to settle quickly. Once you accept the settlement, you will not be able to file a claim for injuries that show up later. That is why it is critical to seek medical attention immediately following the accident and speak with a knowledgeable attorney right away. There are a number of different reasons why rear-end collisions occur. Some happen due to sun glare, fog or smoke. Because of these atmospheric conditions, a driver may not be able to see a vehicle that stops in front of them. Distracted driving accounts for many rear-end accidents. A person may not be paying attention and does not notice traffic coming to a stop due to road construction or because of another accident. Still, other people drive too closely to the vehicle in front of them and do not have an adequate stopping distance in front of them. Whatever the reason, if you have been involved in a rear-end collision due to the negligence or recklessness of another person, it is important for you to contact a car accident lawyer. At The Hoffmann Law Firm, L.L.C., we help people throughout Missouri and Illinois bring lawsuits against the negligent parties that caused their accident. Call us today at (314) 361-4242 or fill out our online contact form to schedule a free and private consultation.